In the island’s four ranges of hills, the largest of which is Mount Petalon (997 m), are marble quarries which were already being worked in antiquity. Thanks to its unusual abundance of water Andros – most Cycladic islands are rather barren – has a flourishing agriculture. Held from 1207 to 1712 by Venice, Tinos had the longest Frankish period of any part of Greece, and in consequence its population includes a considerable proportion of Roman Catholics. The Orthodox population began to increase from 1822, when – during the War of Liberation – a nun named Palagia, guided by a vision, found a wonder-working icon of the Panayia, which soon became the object of annual pilgrimages of the feasts of the Annunciation (25 March) and Dormition (15 August), so that Tinos developed into a kind of Greek Lourdes. The island came into international prominence when on 15 August 1940, two months before Mussolini’s declaration of war, an Italian submarine torpedoed the Greek cruiser “Elli”, which was lying in Tinos harbour for the Feast of the Dormition. 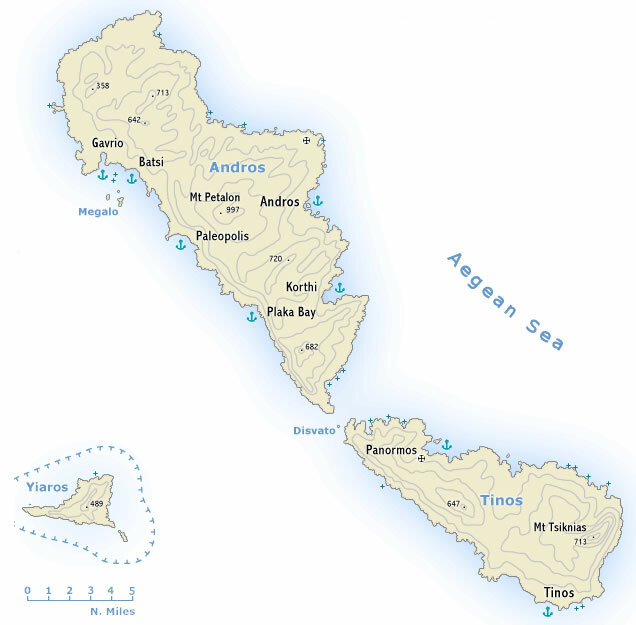 Syros and Paros are the closest yacht charter bases to Tinos and Andros, although Mykonos is even closer it is only a minor (but rapidly growing) charter base. Most sailing holidays will start in Athens orLavrion, though, which are much larger bases to charter a yacht from.